It rained again this past Saturday; a perfect opportunity to catch up with some friends at Bacchus during the middle of the day. Matt McCormick was in town to climb, only to be rained out. If you haven't heard of Matt yet you will. He's one of the most motivated, hard working climbers in the Northeast. I've been crossing paths with him for many years now, but didn't have the chance to really sit down with him until last Saturday. Matt's resume is long and diverse, but recently he's chosen to focus mainly on high-level rock climbing. 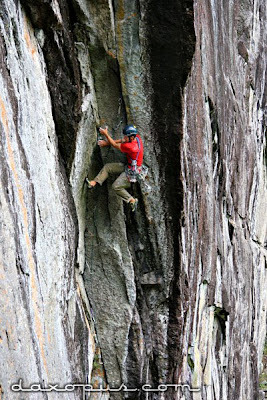 The image at left is of the first free ascent of an old aid line at the King Wall in the Adirondacks. He also just sent a project at the Spider's Web that checks in at 5.13c R. This bold new line called "Wheelin N Dealin" heads up and right of Drop, Fly or Die on minuscule footholds and an incipient seam. Check out this link on the Mammut Team Blog of one of his falls while working the route. We chatted over a few beers and Matt mentioned that he's begun developing individual training plans for climber's looking to improve their performance. Matt is a really talented climber, but one of the things that makes him stand out is how hard he trains. If you're looking to improve your performance for the upcoming ice season, or to train for next year's rock season you may want to contact Matt. His personal blog is called Matt McCormick - Climbing Adventures, Training Programs, and Coaching. His rates for consultation are really reasonable and he and many of his friends have had success using his training plans to improve their climbing performance.